During American Heart Month, I had the pleasure of hosting a group of amazing women at the Red Dress Awards luncheon. Knowing that each of these people had a unique, special approach toward improving heart health, I invited every one of them to join me as a guest columnist in this spot. Some of those who've taken me up on this offer include HSN CEO Mindy Grossman, Woman's Day publisher Susan Spencer and Dr. Lenora Johnson of the National Heart, Lung, and Blood Institute. Today, I'm thrilled to add to this group Denise Bradley-Tyson, the founder and CEO of InspiredLuxe.com, a website that debuts wearable treasures created by artisans from around the globe, most of them women. Denise has long been involved with arts, culture and education in the San Francisco area. 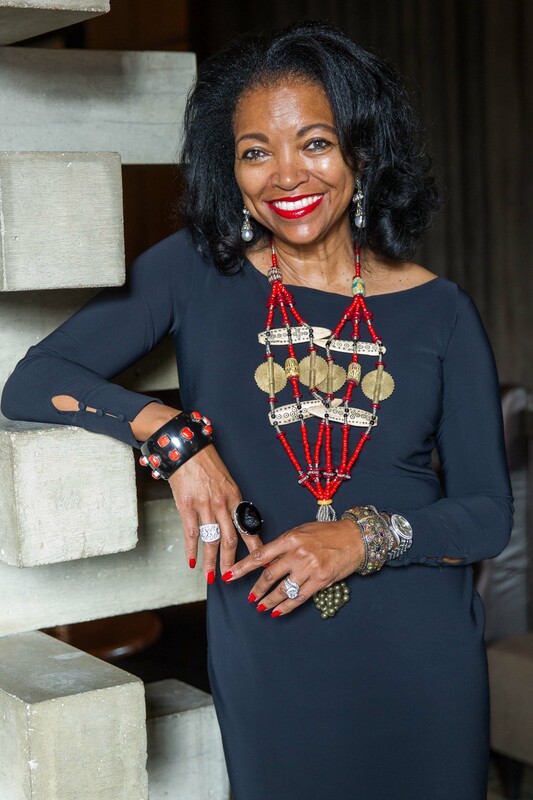 She not only led the opening of the Museum of the African Diaspora in her role as its Executive Director, but she has twice served as President of the San Francisco Film Commission. It's no wonder that she's often recognized as one of the Bay Area's Most Influential Women. She brings a unique, important perspective to this subject, and it's my pleasure to turn this spot over to her. When Nancy asked me to share some thoughts about strategies to best spread the message about heart health, I thought it would be important to target African Americans. And I thought the most compelling way to reach my peers would be by using the story of one of us. After considering several candidates, I came up with a woman who should be at the top her game in the fight to remain heart-healthy. She knew her risks were high because of a family history of high blood pressure and diabetes. She recently was reminded of how this disease can strike anyone at any time when Dennis Green -- an African-American man who was the former head football coach at her alma mater, Stanford -- died of a heart attack. Awareness, in fact, was all around this woman. At the fabulous Essence Festival in New Orleans this year, she was among the over 500,000 mostly African-American women who had wonderful health check-up booths at their disposal. The connection is even more personal, though. Her husband, Bernard, is Chairman and CEO of Kaiser Permanente, and he's a Board Member of the American Heart Association; he even joined Nancy as one of her first guest columnists back in 2013. So when this woman went to her annual physical exam, she clearly understood that heart disease is the No. 1 killer of women and the leading cause of death for African Americans. Still, when my doctor told me my cholesterol level was dangerously high, all the way up into what she called the "red zone," I couldn't believe it. That's right -- the woman I've described is ME! For all the advantages I should have had, I somehow, ignorantly, thought that I was immune to the realities of heart disease. So, of course, I skipped the Essence booths focused on health. I generally feel good so I mistakenly considered myself healthy enough. I didn't full-on exercise like I used to, but I walked a lot. And I wasn't about to cut back on my love affair with fried food. At least, not until my doctor's warning. Being told that this "silent killer" was after me was the wake-up call I needed. Like the saying goes, she scared me straight. First, I began researching what it exactly meant to have high cholesterol, and how I got to this point. I learned that heart disease is primarily due to lifestyle, diet and the incidence of other co-morbidities, or the simultaneous presence of two conditions, such as obesity, smoking, diet and excessive alcohol. I also discovered this is particularly true for us African Americans. The scary part was knowing that you don't need all of those factors to develop heart disease -- all it takes is one. Second, I focused on the ways to lower my cholesterol. The prescription is simple, straightforward and very common sense: stop smoking, increase physical activity (which could be walking, dancing, raking leaves or pushing a stroller -- meaning you don't have to start running if that is not natural to you), losing weight and following a heart-healthy diet. The phrase "just do it" certainly came to mind. If I was going to keep living the life I love, I had to adopt a new way of living. Exercising more has been the easiest adjustment. Changing my diet has probably been the toughest. All of my favorite foods are in the "No Eat" zone: anything fried (especially fried chicken, fried fish, French fries), cheeses, creams and more. But I am now actively watching the foods that I eat and already feel better. I've also found tasty alternatives. There are plenty of delicious fruits and vegetables, whole grains, beans, and lean meats and fish. 3 John 1:2 -- Beloved, I wish above all things that thou mayest prosper and be in health, even as thy soul prospereth. We all are aware of the horrible deaths that happen in our community as a result of gun violence -- which, regardless of the situation, is rarely, if ever, warranted. I'm a firm believer that #blacklivesmatter! We all recognize with frustration that the crimes being committed against African Americans are often out of our control. But we also need to remember that #blackhealthmatters, and that starts with being mindful and actively engaged in keeping ourselves, and our children, alive through the things that we can control immediately, and that is our health and well-being.